I don't want to critisize either of these fine sword manufacturers, I just want some honest comparison (price aside), between them. Most notably the at1520 vs the regent, and the at1563 vs the baron. As far as I can tell the swords are very similar except for one issue, weight. The Atrims seem to be quite a bit lighter. My main question is where is all the weight difference, and how does it affect handling. Thanks for your time. In my opinion very little compares with the Regent. Virtually no modern reproductions have similar design characteristics. The key to understanding this tool is the package of aesthetics and performance it represents. To ignore the aesthetics of the Regent misses the entire point of the sword but it more than holds its own in the handling department. The combination does come at a price premium compared to many other reproductions but it really begins to bump into the quality of some custom jobs that normally cost more. Of course all of this is entirely subjective, but all you asked for is an opinion. "Our life is what our thoughts make it"
"Those who make peaceful revolution impossible will make violent revolution inevitable." Should tell you all you want to know and more. I've moved your thread to the Historical Arms Talk forum, as it's a more appropriate place for it. This idea has been brought up many times before. In order to do a head-to-head comparison and get relevant results, you'd have to have two weapons that could be easily compared. For instance comparing the AT1563 to the Baron would be hard since the Baron has a more typical cross-section for the Type XIIa (lenticular) while the AT has a hexagonal section right after the fuller ends that turns into a diamond section (if I interpret the pics correctly), which is atypical of the type. The grip lengths are different. The pommel shapes are different. The blade lengths and overall lengths are different. Gus is going for a 15th century style, Albion with an earlier period design. Etc., etc. Price can't be factored out, either, since Albion's higher pricetag lets them incorporate a better blend of period looks, design, and handling IMHO. Similarly, it's hard to compare the Regent to the AT1520. They have different stats, and the Regent's blade is very different in cross-section. All these differences make very different swords that are hard to compare. Small differences in stats can have huge impacts on handling. It's a little like comparing a mini-van to a hot rod. Both are cars and will get you where you want to go. But they're designed and engineered using different processes for different purposes and price points. If you're looking for speed, the hot rod is "better" (for you). If you're looking for cargo room and a DVD player, then the minivan is "better" (for you). The weight differences shouldn't be an issue, unless your personal preference dictates one over another. Historical swords varied a great deal in design. Albion's swords are based off much study of period originals and fall well within the weight ranges we see in historical swords. Many of Atrims swords fall to the other end of those same weight ranges, though he's making a lot more models these days that fit the upper end of the weight spectrum. Total weight is, for me, less important than the other factors that influence handling: mass distribution and its by-products static and dynamic balance. I own the Baron and the Regent and love them both. Albion's Duke. which weighs 4 ounces less than the Baron, feels heavier in the hand because of its balance. It's designed properly, as a good representation of its type. If I go by weight alone, the Duke is the choice. If I go by liveliness in the hand, the Baron is the better choice for me. Both companies incorporate historical elements in their designs. Albion, in my opinion, is far more historical in design. For my needs, they're the better choice, as I require performance, looks, and historical accuracy in design. A true comparison would require swords closer to each other in design than the pairings you've suggested. My main question is where is all the weight difference, and how does it affect handling. There are some great spotlight threads that cover balance and weight. Weight distribution is more important than total weight. What ultimately matters in this kind of comparison almost always comes down to individual preferences. For example, consider the Baron. I've tried to get the hang of using it four times at day long cutting parties (for lack of a better term). Try as I might I just can't consistently find the sweet spot and cut with it the way I know it can cut. Other people cut with it just fine at the same events so the issue is me, not the sword. Net effect, I don't prefer the Baron because I'm not consistent with it, which really says nothing about the Baron. 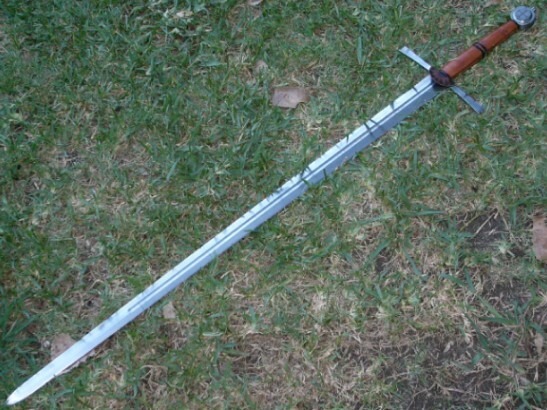 As for some of the other swords mentioned in the thread, IMO the Regent is all sweetness. The Duke is a cutting machine that can make anybody look good at the cutting stand. See how the user component makes a big difference in the percieved preformance and posted response? I have not handled the Atrims in question, so I have no idea what they are like. However I have managed to be less than consistent with an Atrim in the past too (maybe its me). I suspect you will have a hard time finding somebody who has worked with all four of them who can give a hands on response. If you can find somebody who has worked with all of the tools you are asking about, their experience still might not accurately represent your experience or mine or anybody else's. Quite a while ago I gave up trying to guess how a sword will feel and work before I try using it. Especially based on measurements. There is so much going on with modern blades (at least from the top US makers) that length, weight, width, POB, blah, blah blah don't account for that making a decision on this critieria is not the best way to go (IMO). Also previosly mentioned, I'm a muc bigger variable component in the equation anyway. IMO Gus makes good tools that are easy to clean up, are dependable, and are easy on the user. Very important qualities. IMO Albion makes good tools that pay excellent attention to detail, are freaking beautiful and are dependable. Very important qualities. Probably a completely unhelpful response here, but perhaps not. I have not handled the two Albions in question, but I have handled both of the AT's. I found the handling and cutting abilities to be quite remarkable. I have handled a several Albions, and have always been impressed by their attention to detail and fearsome feel! You know this thing will do what it is designed to do! Any choice between the 4 in question will only be settled by what you want to do with it. AT's are for cutting. They have an excellent record for reliablitiy and the price is reasonable. The Albions are historically accurate ( and the price reflects this) and cut just as well. One little extra that a tinkerer like myself likes about Trims, is the ability to change it into what you want and you neednt have to shell out a lot of dough to get it. This is what I did to my AT 1415 and Oakeshott's Sword in the Age of Chivalry! Tom, that is very nice. I take it you re-did the hilt? Excellent job. Who did the lettering on the blade? Good, Bad, I'm the guy with the gun!!!! Rather than ask us to do your work for you I would suggest that you spend some time going through our review section. Many of these swords you've asked about are featured there. I would also suggest that you have a look at another website: Sword Forum International. There is more than a little talk concerning Atrims to be found on SFI. So instead of taking the lazy man's approach (no offense meant) why don't you utilize the resources we've spent a lot of time and effort developing. That way you'll be able to draw your own conclusion as to which sword is best for you (you're really the only one who can decide that after all), and you'll educate yourself in the process. The real issue John's asking about is comparing models from the two brands side by side to contrast handling. As I said above, to compare two swords and get relevant results, you'd need comparable swords in basically every way. Even if both companies based swords on exactly the same original and made the major stats all the same, it may be hard to compare handling since the price does have an effect on that. If Albion limited themselves to the price range of Gus's swords, their swords would be different swords entirely. Similarly, if Gus put the extra things into his that would push them into Albion's price range, it would change things. So price can't be discounted since it affects looks, historical accuracy and performance. So I think the kind of comparison John is looking for wouldn't be of much value. First, you'd have to have comparable swords. Then you'd have to define your handling criteria, if that's what the comparison is based on. Handling in what types of situations/drills/techniques? Cutting (against what types of targets?)? Thrusting (again, against which targets?)? Etc., etc. Again, the swords would have to be designed with the same performance goals in mind for a comparison to be valid. Wow I didn't expect to get near that much help in just one night, I think you guys have answered my question, the main thing was I wanted to know where the pound of steel was going, and if the lack of the steel made the atrim feel a little weak in the thrusting department. I didn't even take cross section into account, and I can't seem to find blade thickness anywhere, I'm leaning towards the albions, but I do like the easy customization of the atrims. Maybe I'll just have to get one of each. Thanks for all the great help guys, it's really appreciated. This idea has been brought up many times before. In order to do a head-to-head comparison and get relevant results, you'd have to have two weapons that could be easily compared. For instance comparing the AT1563 to the Baron would be hard since the Baron has a more typical cross-section for the Type XIIa (lenticular) while the AT has a hexagonal section right after the fuller ends that turns into a diamond section (if I interpret the pics correctly), which is atypical of the type. The AT1563 is not really a XIIa. 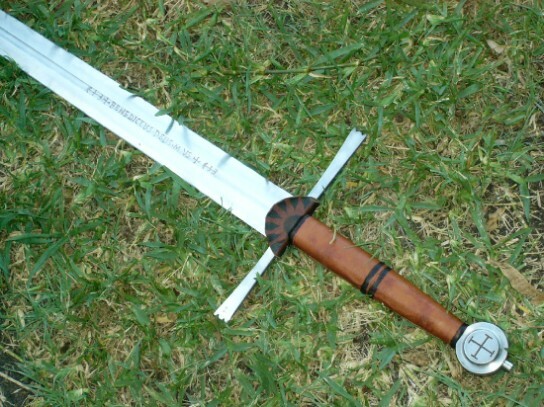 For those that seem to always want to classify a sword, I suppose two dimensionally it does resemble a XIIa, but its really just a fifteenth century longsword with a fuller. Thanks for the clarification. I grabbed the Type XIIa classification from Bill's review ("The sword reviewed here is based on an Ewart Oakeshott Type XIIa") and assumed that is why John wanted to compare it to the Baron. Once again, this proves why the two swords would have a hard time being compared to one another. They aren't based off the same original, or made to be from the same era, or made to have the same blade form, etc. Amen to that. That's what I've been trying to say in this thread. To compare two things they have to be comparable, and quite often in this market, they're not. Different companies have different philosphies, design goals, design processes, and price point goals. Apples-to-oranges for sure. Perhaps if the potential buyer tells more about his expectations you could give more advice? I strongly agree, that's why I urged John to do his own research rather than rely on us to do it for him. Since the the results of any kind of comparison would largely be meaningless all he would be getting is a lot of personal perspective. This would undoubtedly differ from his own perspective so he's better served by doing his own research, and reaching his own conclusions. All we can tell you for sure is that they are all fine swords. Your idea of buying one of each is probably a good one. In my experience, Atrim blades tend to have weaker fit and finish than Albion to include assymetrical edge grinds and more polishing flaws. Albions tend to have assymetrically ground crossguards based on the several I have examined and those I own. The Albions are in a different class than Gus Trims swords in my honest opinion altogether.